It’s been wonderful to have a couple of weeks of travel after the conference was over — great times in Ireland and Scotland with family and friends. But I don’t want to miss the chance to talk over the next few posts about some of the ideas that are still turning over in my head from the Sheffield conference on Study of New Literacies. The set of ideas that I seemed to me to keep coming around in the conference – and that have kept me pondering since – has to do with space, movement, and boundaries. 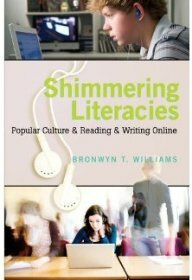 Although they came at the question from several different directions, I was intrigued by the ongoing discussion of the how our literacy practices are shaped by and shaping the spaces in which they take place. And space here is something that we are inhabiting and creating both on and offline. In fact, one things I was particularly pleased about was the work everyone was doing at troubling the binary divide between online and offline. Instead there was much more recognition about how we not only move on and offline quickly – and all the more so with smart phones and tablets becoming more common – but how difficult it becomes to separate cause and effect, or place and space, between the digital and the embodied. A number of presentations and conversations raised questions of how digital technologies connect us, yet also how they can establish barriers and obstacles that can cause us either to give up, or try to find away around. At the same time, we respond to these digital spaces not just with our minds, but also with our bodies and emotions and bring those back, in turn, to the online places we inhabit. Cathy Burnett, of Sheffield Hallam University, raised a serious of questions about space, mobility, and boundaries in her presentation on classrooms she is observing. I was fascinated by her descriptions and analysis of the kinds of boundaries teachers often try to create in the classroom – both online and off — in terms of students’ practices (and teachers’ as well). She noted moments when students disrupt such boundaries and how that both brings them into sudden focus, and also challenges us as teachers to define the nature and purpose of the boundary. Her discussion of the ways in which such boundaries shift, open, and close almost moment by moment had me thinking about the courses I had most recently been teaching, as well as what I have observed doing at their computers outside the classroom. There is an image of students deeply focused on computer screens, oblivious to all around them, is rarely true. Instead, as Burnett’s presentation pointed out, students move away from the screen, use their bodies to shape their interactions with the technology, get up and wander the room, make side comments, even as they continue to post comments on a forum or engage in a class assignment. While there are connections here to ideas like Robert Brooke’s discussion of underlife in the classroom, I like the way she theorizes this not simply as a set of behavior’s, but also as practices located in specific texts and contexts. Her challenge to think of “siting as a productive practice” in which we engage with the mobility and shifting boundaries of our teaching and of literacy practices resonated with me. I can’t wait to read more of her work on this. It also make me think of how, when students are outside of school they find that they are still navigating these spaces and boundaries, sometimes created in the home, sometimes by those who control online environments, and adapting their reading and writing to the spaces they can find and work within. It made me think of how, in my own research, I see young people working within and around the online popular culture spaces they encounter. As I’ve said other places, while Gee’s idea of online “affinity spaces” as places were people are drawn by interest first, regardless of identity are true to a point, it is also the case that offline identity shapes not only the affinity spaces we are drawn to, but how we react and respond to the interactions once we get there. What’s more, the negotiations of language and culture we have to engage in online affinity spaces seep back into our embodied lives and are not left behind with the computer. It also connected with comments and presentations by David Barton, Keri Facer, Margaret Mackey, Karin Tusting, Eve Stirling, and others at the conference, and got me thinking more about where my thoughts about my research are taking me next. But that will have to wait for the next entry or two.